The government (Law ministry) recently referred the matter of Uniform Civil Code (UCC) to the Law Commission to seek its opinion. The UCC debate has been raging on since independence but has seen many ups and downs depending upon the political ideology at the helm and political exigencies. 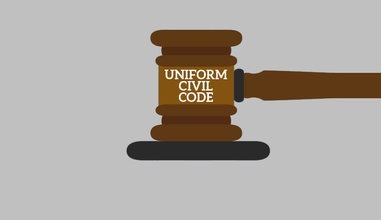 Though one often hears the term Uniform Civil Code in public discourse, its meaning is little understood. Currently, there are a number of family laws like Hindu Marriage Act, 1955, Muslim Personal Law (Shariat) Application Act, 1937, Christian Marriage Act and Parsee Marriage and Divorce Act to govern communities in matters related to marriage, divorce, succession and inheritance, maintenance, custody of children and adoption. A Uniform Civil Code would replace all these family laws with one law. BJP leader Venkaiah Naidu in his article recently laid out his arguments for bringing in a UCC. Firstly he pointed that women face gender discrimination on grounds of religion. He also made a case for UCC by calling it a cornerstone of secularism and leading to national unity. He further emphasised that Article 44 of the Constitution directs the State to secure a UCC (Naidu, 2016). Though this sounds simple and desirable to many, the proposition of UCC is fraught with many problems and thus a nuanced understanding of the issue is imperative. Though earlier the feminist movement demanded UCC, the demand was dropped after realising that the UCC was more of posturing to demonise the minorities and perhaps replace the religious laws of minorities with equally patriarchal (if not worse) traditions of elite Hindus. However, today the clamour for UCC is coming from the BJP and Hindu Nationalists. The myths that are propagated by the BJP in support of the UCC can be understood from the following binary. The Hindu women are liberated and have achieved equality through the reforms in Hindu family laws. Hindu laws are, however, neither gender just nor uniform. Hindu nationalists, on the other hand, project Muslim women as discriminated and victimised by practices like triple talaq and polygamy. They prescribe UCC to be a saviour of Muslim women. This article would like to examine all the arguments in some details starting with how UCC is constitutionally binding since it is included in the chapter on the Directive Principles of State Policy of our Constitution as Article. Unlike fundamental rights, directive principles of state policy are not justiciable that is, they can’t be enforced by a court of law. They is no timeline for its implementation but merely work as a guideline to the State in formulating its policies. While the Directive Principles of State Policy has many more important provisions like ensuring living wages, just economic system just and fair distribution of resources that would ensure there is no hunger and farmer suicides but the policy of the NDA Government is contrary to these provisions. As a result, the Dalits and farmers have been brought on the verge of suicide and violence. The SEZs and industrial policies of the State has led to environmental degradation and de-rooting livelihood/ displacement of the poor. However, only UCC cows protection ironically seemed to enjoy the highest attention of the BJP government. It is absurd to think that for UCC will result in national integration and unity. The United States of America which is considered as an example of strongly united and integrated nation has 50 different family laws, and also criminal laws as there are 50 states. Having a common law doesn’t necessarily ensure national integration. National unity is not hampered by pluralism. In fact, diverse cultural practices and social customs indicate towards democratic spaces available to its citizens. Democratic institutions and equality of opportunity strengthen national unity. Family laws enable communities to uphold their cultural practices and social customs as per their religion, an institution considered very intimate. By thrusting one law down everyone’s throats may result in alienating communities and exposing fault lines in the Indian social fabric. Raj Kumari Amrit Kaur said, “How would a Uniform Civil Code be conducive to national unity when uniform laws for crimes, contracts, torts and constitutional rights could not promote it (Gangoli quoting G.S. Bhargava, “Towards a Common Civil Code”, Mainstream, March 6, 1983). Some provisions that zealots have tried to reform have not translated into any change on the ground and thus the lived realities of women. For instance, as pointed out by Flavia Agnes, Hindu women suffer unspeakable plights when they have to claim maintenance from the husbands who had a subsisting first marriage. Hindu men despite the abolition of polygamy contract more than one marriage through dubious ways. The women or wives who don’t have a valid marriage face the stigma and humiliation of having the status of being ‘keeps’ and mistresses’. Moreover, they have no rights to maintenance or property. Brahminical practices like Saptapadi and Kanyadaan are essential ingredients of a valid marriage according to the Hindu law. But there are communities where these customs are not followed and thus their marriages are not recognised(Agnes, 2015). This places the women outside the ambit of protection and rights. The rights they had earlier are no more available to them due to the quest for a common law that governs the Hindus. Would a linear legislation like UCC able to address the complexities of the social and cultural diversity that Hindu women grapple with? By taking a stand based on morals, which is alien to a culture, is on ground disadvantaging women to negotiate for justice and rights. One step towards UCC was the introduction of the Hindu code bill by Nehru and Dr. Ambedkar in the Parliament. When the Hindu Code Bill was tabled in the parliament it was opposed vehemently by the Hindu Mahasabha leaders, N.C Chatterjee and Shyama Prasad Mukherjee terming it as a threat to the fabric of Hindu society and leading to its breakdown (Jeffrelot, 2003). The Bill tried to reform the Hindu law in a limited way by abolishing polygamy amongst Hindus, laid down procedures for divorce and gave rights to daughters equal to that of widows and sons in the inheritance of father’s property. This Bill didn’t go down with the opposition as well some of the Congress leaders forcing Dr. Ambedkar to resign as the law minister. It is surprising that now the Hindu Nationalist Organizations want a UCC on the grounds of justice to women when they rejected limited rights for Hindu women in the form of the Hindu Code Bill. The Hindu nationalists, who resisted reforms in laws applicable to the Hindus and which intended to give Hindu women better rights now want to become champions of the cause of Muslim women’s rights and draft a UCC. Can they be trusted? UCC can’t be understood narrowly to mean equality for women of different religions, but also equality between men and women. The root cause of inequality between men and women is patriarchy and resultant patriarchal structures and this cause has to be addressed first. Till then no law can be implemented for rights of women. As the prominent women’s activist and legal luminary Indira Jaising terms it, without equality to women, the UCC will remain a ‘common code of inequalities’(Modi, 2003). In India, there is not only diversity in terms of religions but also within each religious community. For instance, the Adivasi communities have their own customary practices governing them which give more rights to women regarding marriage and divorce than their counterparts among caste Hindus. Adivasi women for example to fight more equal rights related to land would find it cumbersome to follow the law which is practised through formal courts of law and instead would prefer their customary practices like approaching the Adivasi council or panch (Omvedt). Tarawad and tavazi female-headed joint family systems in the South of India have line of descendants through female was brought to an end with Hindu Succession Act, 1956. According to Sambandham practice, women continued to live in their natal house after marriage and children belonged to their caste and tarawad. Marriage among lower castes is less sacramental and more of contractual (with consent of adults marrying) without the rituals of sapatpadi and kandyadan. Which law or practice will the BJP adopt in the UCC? Similarly, the Quran has mentioned rights for women. Since marriage is a contract under Muslim law, there is a nikahnamaand requires signatures and witnesses. Likewise, women also have an equal right to divorce. The Muslim women are given mehr by the groom on the wedding which is exclusively her property and offers some safeguard from destitution in case of divorce. Does this mean that UCC will have the best practices from all personal laws? Does the state not betray bias towards majority religion and will this inspire confidence in minority communities? The above arguments still haven’t answered the specific question of triple talaq or maintenance. Here it can be pointed out that the Domestic Violence Act 2005 and section 125 of CrPC have been able to secure the maintenance rights of Muslim women. Similarly, the landmark judgments like Daniel Latifi and Shamim Ara have gone a long way to check the arbitrary divorce by Muslim husbands. The British refrained from a UCC but nonetheless tried to ‘reform’ some aspects of personal laws by passing some legislation. For instance, the Muslim Personal Law (Shariat) Application Act in 1937 and Dissolution of Muslim Marriage Act in 1939 were passed. These laws ensured that all Muslims be governed by the Sharia and women have a right to divorce. This juxtaposed with the rights of Hindu women during that time paints a bleak picture of the Hindu society. Hindu law still considered marriage a sacrament and thus holy and indissoluble. This perspective denied Hindu women the right to divorce, maintenance and inheritance to widows. To that extend the Hindu laws were considered ‘barbaric’ and backward’. This point is significant since today the public discourse is shaped to believe that Muslims governed by Muslim personal laws are ‘backward’ and discriminatory towards women. So what can explain this rabid insistence on the UCC? The insistence on the UCC is a ruse to stigmatise and stereotype the Muslim community by creating a discourse that Muslims are anti-national and not loyal to India. This propaganda wants us to believe that Muslims are backward, virile and disrespectful towards women. The UCC is an instrument to justify and legitimise this propaganda. It is reinforcing the second class citizenship status of the Muslims and their power to negotiate legally for their rights. The real concern is not gender justice or equality to women. By raising the bogey of UCC, their propaganda of Muslim men marrying four wives and the myth of Muslim virility gains currency. This is part of the larger scheme to vilify the Muslims in the country. The agenda is also to impose homogeneity in all institutions of the society. This is not surprising given the State’s position on beef ban or the impunity given to extra-state actors like the Gau Rakshaks to perpetuate violence and threaten diversity or freedom to choice. The State turning a blind eye to organisations spreading the myth of love jihad which is leading to polarisation of communities and adversely affecting the agency of Hindu women is a window to the perspective of Hindutva ideology about women on a whole. The ideology inherently privileges men over women and aims to reproduce patriarchal structures and discourses. It is interesting to note that leaders in the freedom struggle had minced no words to warn the British to not interfere with Hindu law stating that it amounts to interference with religion. It is hypocritical then to demand a UCC which will trample on the cultural rights of other religious communities. Extending the Hindu laws to other communities will be extending injustices seen above to other women when they enjoy certain rights. There is no doubt that women experience oppression and discrimination on account of social structures and institutions, religion being one of them. However, by discarding in totality a legal system based on religious tenets is not the answer to address the issue of gender inequality. There is a need of reform within family laws. Women must have equal participation and decision-making in the process of this reform. The key is to strike at the root of gender inequality and patriarchy. When the existing social order where women are inferior to men is changed, can there be implementation of any law? Laws don’t operate in a vacuum. In order to ensure equal rights to women, efforts must be made to spread awareness about the legal safeguards available to them within the existing laws- personal as well as civil. This awareness and capacitating them to explore these options along with reforms will go a long way in helping women in multiple locations reclaim agency and rights. The key to gender justice is not common law. The attempt at uniformity has adversely affected the rights of a large number of women. Justice and equality will be ensured by having uniform standards/principles of justice across personal laws.